This article is about the spaceship manned by Mario in a The Super Mario Bros. Super Show! episode. For the spaceship Mario controls in Super Mario Galaxy 2, see Starship Mario. 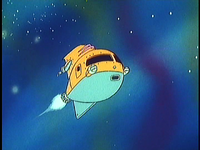 Mario's spaceship is a large, yellow spaceship seemingly owned by Mario in The Super Mario Bros. Super Show! In The Super Mario Bros. Super Show! episode "Stars in Their Eyes", Mario, while fleeing from Space Troopas in a swarm of fiery meteors, accidentally damages his ship when it is struck by a meteor; due to this damage, the ship lost all of its fuel and had its door knocked off, resulting in all of its supplies being sucked into space. With the spaceship damaged, Mario is forced to crash land it onto the planet Quirk, right on top of Astro Mouser. This crash damages the ship even more, meaning, along with getting fuel and supplies, Mario, Luigi, Toad and Princess Toadstool need to fix the ship as well. After a lot of trouble with Astro Mouser, Moon Man Koopa and several Koopa Troopas, Mario, Luigi, Toad and Princess Toadstool manage to gain all of what they need for their ship from the helpful Quirks. Repairing his ship, Mario leaves Quirk and battles Moon Man Koopa and his spaceship. After a perilous and narrow battle, Mario, Luigi, Toad and Princess Toadstool manage to defeat Moon Man Koopa and release the enslaved Quirks from his rule. Along with supplying its crew with oxygen and regulated gravity, the spaceship also has a somewhat odd offensive capabilities; the ship can shoot blasts of spaghetti and meatballs from cannons mounted on the side of it. This page was last edited on January 29, 2019, at 12:10.